One of the best movies I have seen this summer is Disney’s Christopher Robin, which releases on Friday, August 3, 2018. With heartfelt moments, whimsical characters, and a loving message about the importance of family, it reaches an audience of both children and adults. Featured today on Theresa’s Reviews, you can check out my review of Christopher Robin and free activity pages. What would you do if you were going about your stressful, worrisome adult life, when your best magical friends from your childhood showed up to help you? 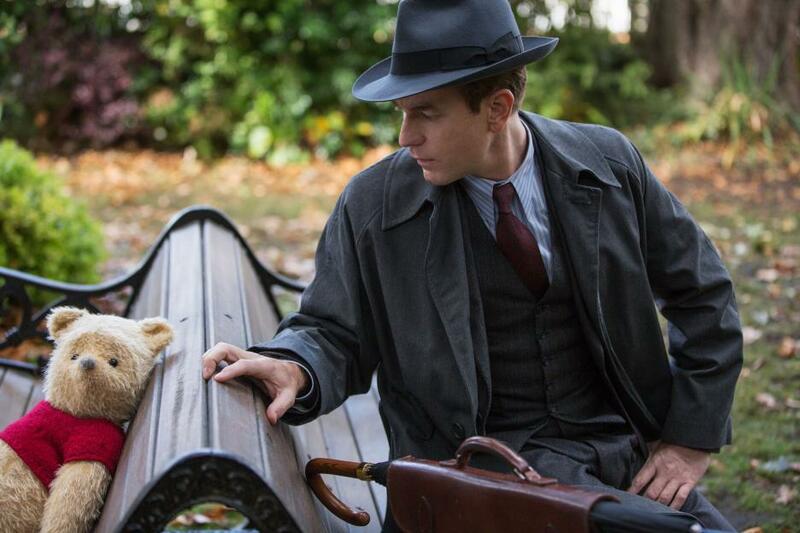 In Disney’s new release Christopher Robin, you can find out what happens with this unique group of characters who are always there to help one another. Winnie the Pooh is still the lovable creature that he was in the cartoon. With simple ideas and a big heart, he captivates the audience with quotes that could only be from him. People say nothing is impossible, hehe, but I do nothing every day. Sometimes when I’m going somewhere and I wait, a somewhere comes to me. You might not expect a silly bear who claims not to have much of a brain to be the wisest character in the movie, but he is. This is a nice reminder that when faced with adult decisions and problems, you can find the correct path by thinking back to the innocence and playfulness of your youth. After seeing the movie, my children shared their thoughts on their Instagram page. They explained that seeing the Hundred Acre Wood characters in live action wasn’t as cute as the characters were in the cartoon, but the plot was more exciting. After finishing boarding school, getting married and having a child, and finding a stable yet unexciting and unfulfilling career, Christopher Robin has found that adult life isn’t easy, and that fun and excitement are merely a distraction. As a workaholic father trying to provide for his family, Christopher Robin reluctantly goes on an adventure with the goal of making his pesky childhood friend Winnie the Pooh leave him alone. With a theme of leaving your childhood behind, the movie had some sad moments, yet it resonated well with an adult audience. The plot reminded me of the devastating moment in Inside Out when the main character Riley’s childhood friend Bing Bong is lost forever. While that moment in Inside Out only lasts a minute, in Christopher Robin that concept continues through the whole movie. Christopher Robin is an adult struggling to find a work life balance, and he has forgotten how to have fun. To him, life is about attending the most rigorous school to prepare for a decent career and he hopes for his daughter to do the same, but he has lost sight of what really matters, which is family. You can’t get through life alone, even with the best degree or the best job. Although I hadn’t been sure what my children would think of the movie because of its main character being an adult, they thought it was fantastic. Even my five year old, who I thought would get bored not watching a cartoon, said that she thought the movie was exciting and funny. She adored how Winnie the Pooh stumbled into Christopher Robin’s life with a silly clumsiness. When a shelf fell off the wall and honey spilled to the floor, my daughter smiled with happiness. 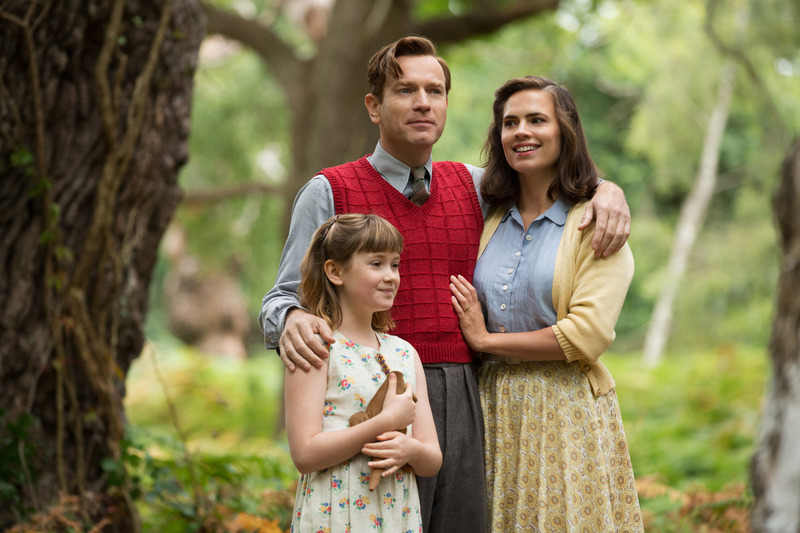 Directed by Golden Globe nominee Marc Forster, Christopher Robin stars Golden Globe winner and Emmy nominee Ewan McGregor as Christopher Robin and Hayley Atwell as his wife, Evelyn. Bronte Carmichael plays his daughter, Madeline and Mark Gatiss is Giles Winslow, Robin’s boss. This movie has the voice of Jim Cummings as Winnie the Pooh and Tigger, Brad Garrett as Eeyore, Golden Globe nominee Toby Jones as Owl, Nick Mohammed as Piglet, Peter Capaldi as Rabbit and Oscar nominee and winner Sophie Okonedo as Kanga. With London as the picturesque location, the magic of Winnie the Pooh helps keep happiness alive in the hearts of both children and adults. 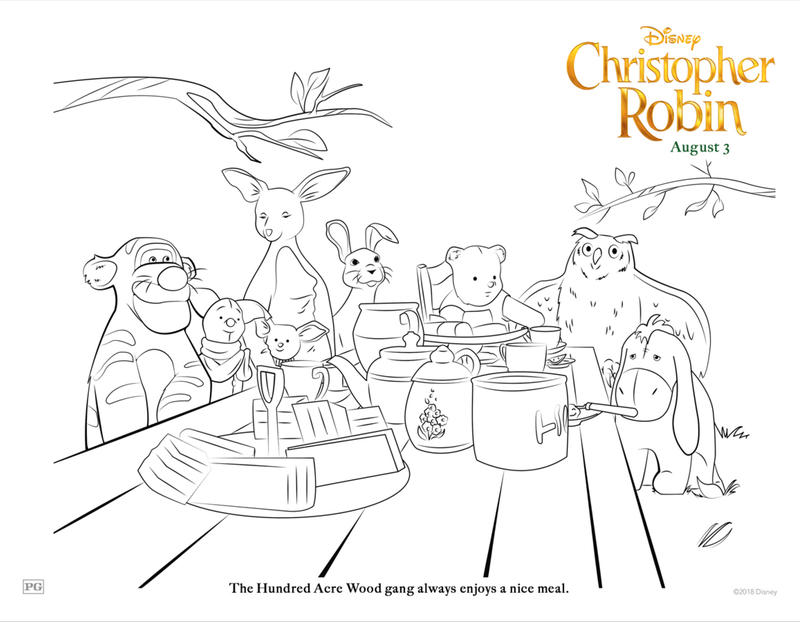 Looking for fun Christopher Robin activity pages? Check out these free coloring sheets, activities, and DIY crafts! For more Disney movie reviews and activities, follow Theresa’s Reviews on Facebook, Twitter, Instagram, Pinterest, and YouTube. We’ve been wanting to see this movie! I love your review! You did an amazing job. 🙂 Also, these coloring sheets are awesome! Definitely printing some for my toddler. Thanks for sharing this!